Deutsche Bank: death by a thousand cuts? Deutsche Bank remains between a rock and a hard place. It has yet to persuade US authorities to lower their demand for $14 billion to settle allegations that it mis-sold mortgage-backed securities before the financial crisis. In the meantime, its share price has followed vacillating sentiment amid a landscape of ultra-low interest rates, new regulations and its increasing loan losses. Europe’s biggest lender has also been dogged by speculation that it will need a bailout from the German government, something Chancellor Angela Merkel would be loathe to initiate given the prospect of national elections next year. Post-Brexit jitters have been reflected acutely in European banks’ stock prices. As a vital cog in global markets, the naval gazing that has followed has prompted a great unravelling of Deutsche’s constituent parts – with fingers being pointed in all directions looking to apportion blame. 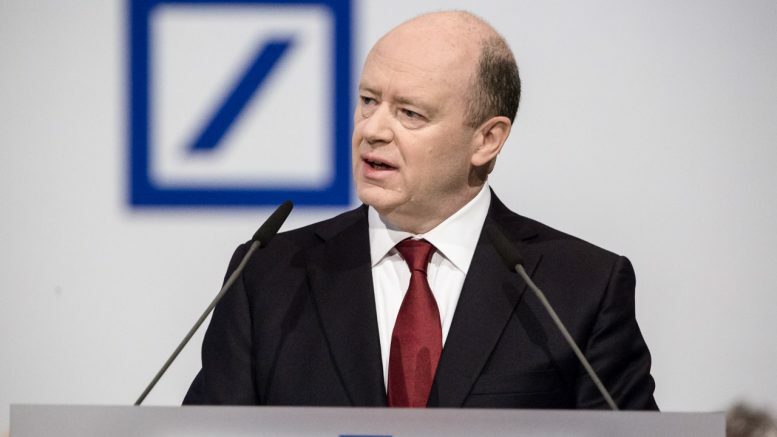 John Cryan, Deutsche Bank’s chief executive, sought to soothe nerves over the bank’s future last week. A group of institutional investors had sought to reduce their exposure to Deutsche by moving part of their listed derivatives holdings to other firms. However, Mr Cryan was immediately lambasted by Sigmar Gabriel, leader of the centre-left social democrats and Germany’s economics minister, who said: “I didn’t know whether I should laugh or be furious that a bank which turned speculation into a business model now declares itself the victim of speculators”. Mr Cryan said the bank had made a pre-tax profit of €1.7bn in the first half of the year, and he underlined the strength of its liquidity reserves, which stand at €215bn. Deutsche Bank shares opened higher on Tuesday on rumours that the lender would negotiate a US Department of Justice (DoJ) settlement of only $5bn, but later paired back those gains. The stock had sunk to 33-year lows late last week. Traders were expecting more volatility in the coming days. “With no updates so far on the case, expect the stock to remain on a roller coaster,” said Hussein Sayed, FXTM chief market strategist in a note on Tuesday. The bank’s potential collapse and the resultant systemic risks posed to European financial markets has brought closer inspection of negative interest rate policies on financial institutions across the eurozone. While weakness has been apparent in peripheral states, particularly Italy, France and Spain, the threat to bank balance sheets has now moved to the core of the eurozone. Commerzbank, the second-biggest bank in Germany, suspended its dividend last week. It had earlier announced that it would cut 9,000 jobs as it too struggles in the face of ultra-low interest rates and increasing loan losses. One option, should the German government seek to intervene without a direct bailout, might be for a merger of both banks, with the state taking a part share. The perceived vulnerability of European banks had been highlighted after the June vote by the UK to leave the European Union. This growing anxiety now threatens to spread across the European monetary system and global markets.